She made her last appearance as Clara Oswald in 2017. 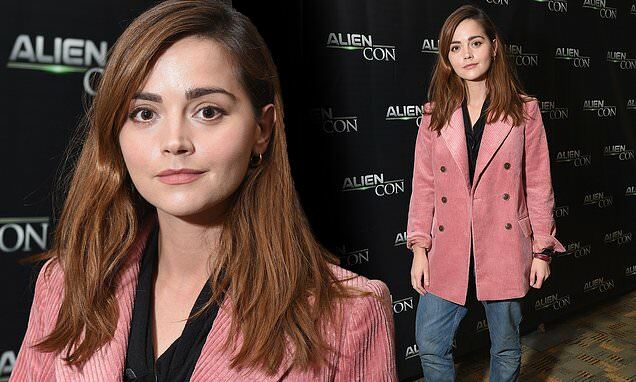 But Jenna Coleman is still very much part of the Doctor Who family, as she reminisced about her time on the cult classic show during a panel at AlienCon 2018 in Baltimore on Friday. The actress showed off her quirky sense of style in a dusty pink coat as she posed for photos and greeted fans. Jenna, 32, looked effortlessly cool in her courdroy jacket in a pretty pink hue, which she teamed with loose fit jeans. The star ditched the glam heels in favour of chunky lace up boots. She wore her chestnut locks in a loose straightened look and let them naturally tumble past her shoulders.